birdRS: Climate change and host parasite effects on European bird species - PLoS One research article summary. Climate change and host parasite effects on European bird species - PLoS One research article summary. Assessing the effects of climate on host-parasite interactions: a comparative study of European birds and their parasites. The symbiotic relationship between a parasite and its host is finely balanced with a multitude of factors tuned to provide the perfect circumstances for both individuals to gain a benefit. External factors such as changes in the host's environment may cause this balance to shift, to the benefit or detriment of either host or parasite. This study looked at the effects of medium term (5-15 years) climatic change (by temperature) on clutch size, brood size, body condition, and population size, for 24 species of birds and their associated 89 parasitic populations (17,891 individuals). The parasite taxa included protozoa, feather parasites, diptera, ticks, mites and fleas. Bird sampling was carried out in 26 sites across Europe, by 37 independent scientists who had previously reported host / parasite data. This research article concludes that there is a clear relationship between an increase in temperature due to climate change and an increase in the parasite population. As there is an additional association between effects in the host and the level of parasites, the hypothesis is that climate change will subsequently affect the bird hosts. The figures below are examples of the some of the findings from this article in support of their hypothesis. Figure 4. 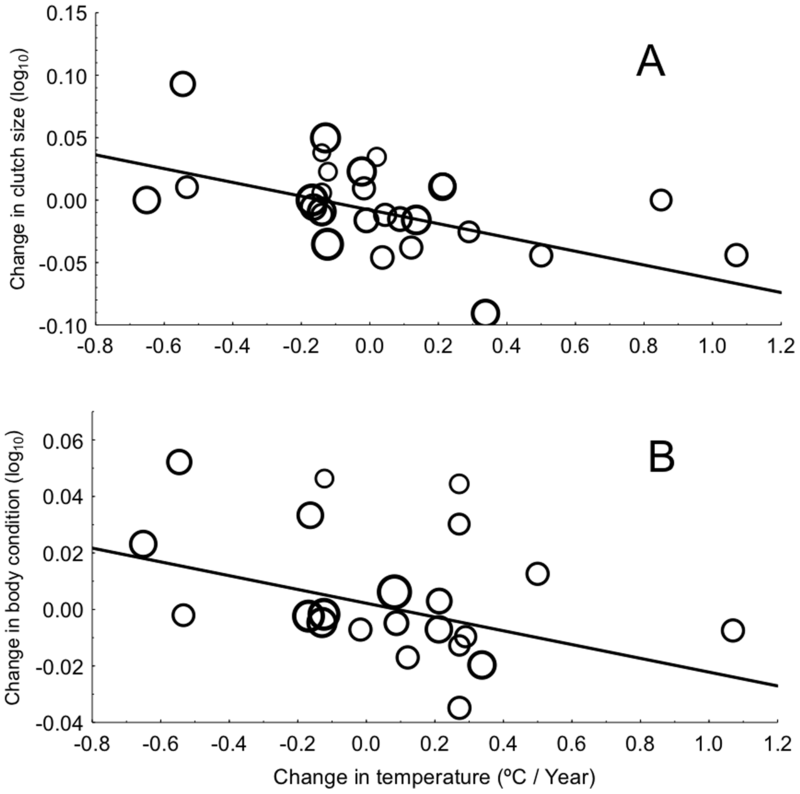 Host clutch size and body condition in relation to change in temperature. (A) Change in clutch size in relation to change in temperature. (B) Change in body condition in relation to change in temperature. The size of symbols is proportional to log-transformed sample sizes, while the lines are linear regression lines. Figure 5. Change in parasite abundance and parasite prevalence over time for different categories of parasites. 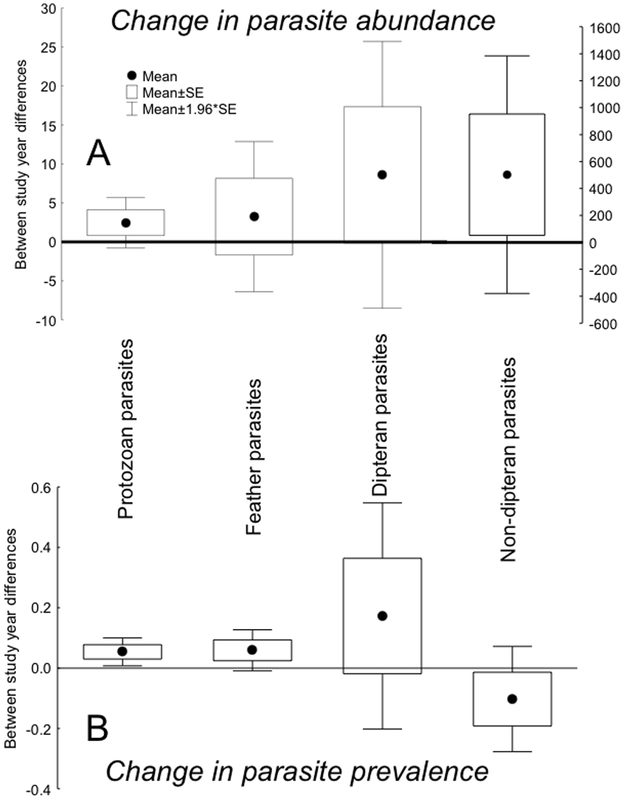 (A) Change in parasite abundance and (B) change in parasite prevalence between study years for different parasite taxa. Box plots show means, standard errors and 95% confidence intervals. The right Y-axis in (A) is the number of non-dipteran parasites.